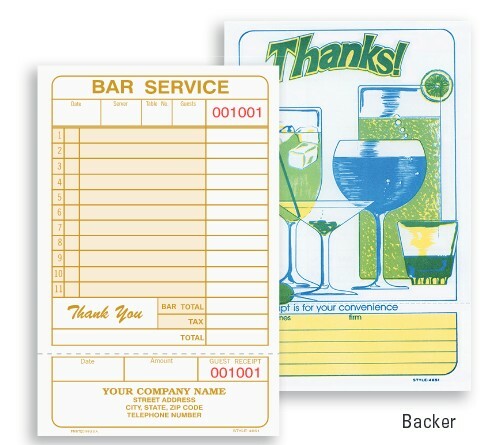 The 4651 - 1 Part Bar Guest Check for Restaurants are a great stuff guest check for use at the bar. The 4651 - 1 Part Bar Guest Check for Restaurants is an attractive guest check with 11 lines on an attractive form with a tear away guest receipt for your customer's tax or other record keeping needs. This bar guest check is printed on a 32 pound bond paper. The 4651 bar guest checks is one of the board guest checks Pegasus Ventures offers for sale. For an idea of the paper, the paper typically used for your home printer is a 20 pound bond paper. The 4651 1 part bar guest checks are in stock and ships the next business day. 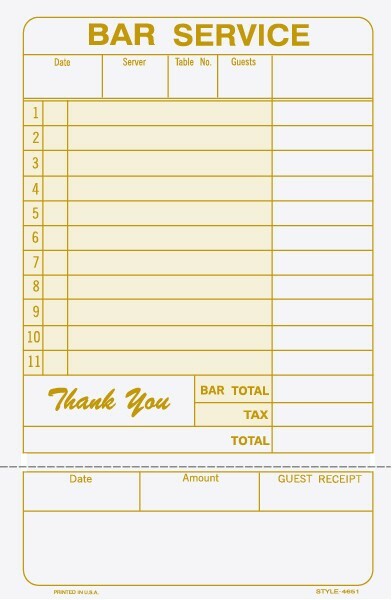 This bar guest check is available for custom imprinting, see the related 4651C Bar Guest Check for Restaurants for more information. Pegasus Ventures brand restaurant guest checks come with volume pricing. The more you order, the lower your per case cost for your guest checks. The 4651 - 1 Part Bar Guest Check for Restaurants come with substantial savings as you increase the number of cases ordered.